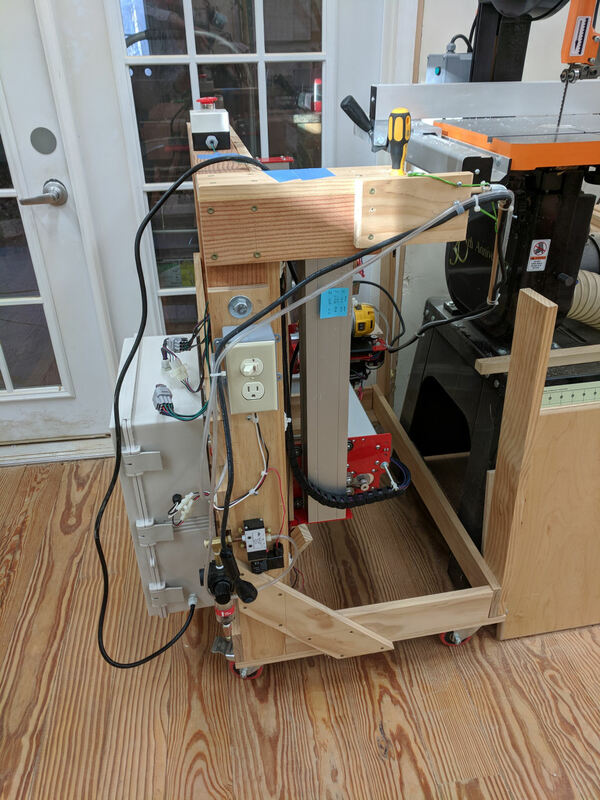 In my previous posting on updating my CNC Router, I replaced the mechanical system with a whole new system that was more stable structurally than my original home brew system. I mounted the new mechanical system on the old system’s frame (as it was mobile and could be folded up for storing) and kept the old system’s electronics. I soon found that the old electronics were not going to work very well with the new mechanicals. 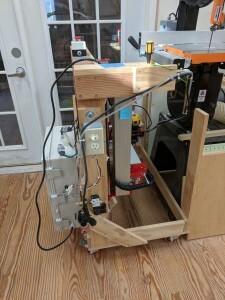 The new mechanism had a lower resolution movement per step of the stepper motors (to allow faster movement), but this meant the electronics had to be modified for finer steps per revolution (microstepping) and the old electronics were implemented with low cost stepper drivers and could not drive the motors fast enough with the increased stepping rate. I concluded that it was time to totally redesign the electronics to meet the improved stability of the new mechanicals. I purchased the electronics in the Winter of 2016 but only recently got around to working on it. The results are SPECTACULAR! Not only is the new system a lot faster (3-5X), it is also a lot quieter with the faster switching electronics. The resolution and accuracy appear to be excellent and MUCH smoother! Here is the old hybrid system with the new electronics sitting on the table next to the router. I did this to make sure everything was tuned up before I tore apart the old electronics. 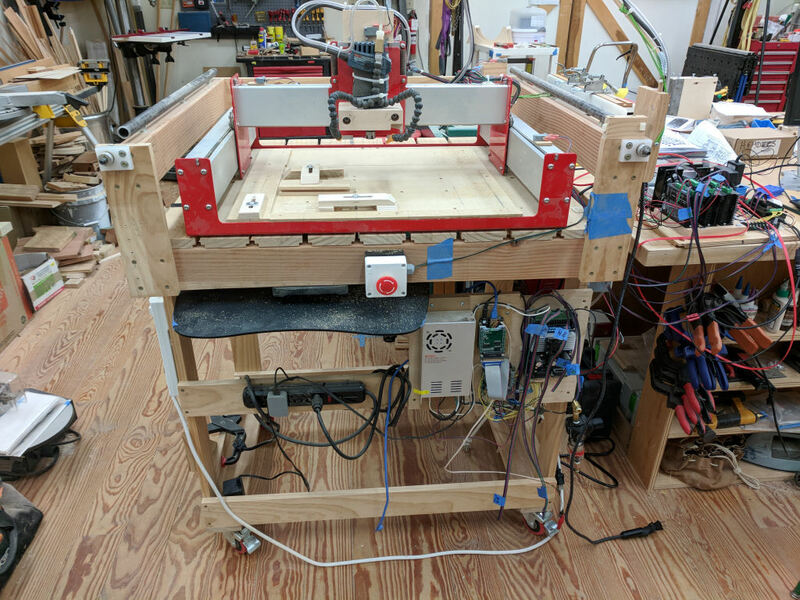 CNC Router after previous upgrade and readying for new electronics. 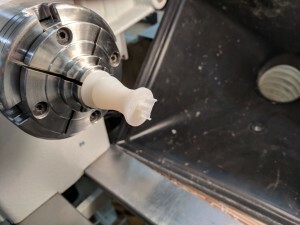 The results were very promising but only after I also replaced the Z Plate in the Shapeoko mechanicals. The old Z Plate had too much flex and would not be able to handle the work loads I have in mind. 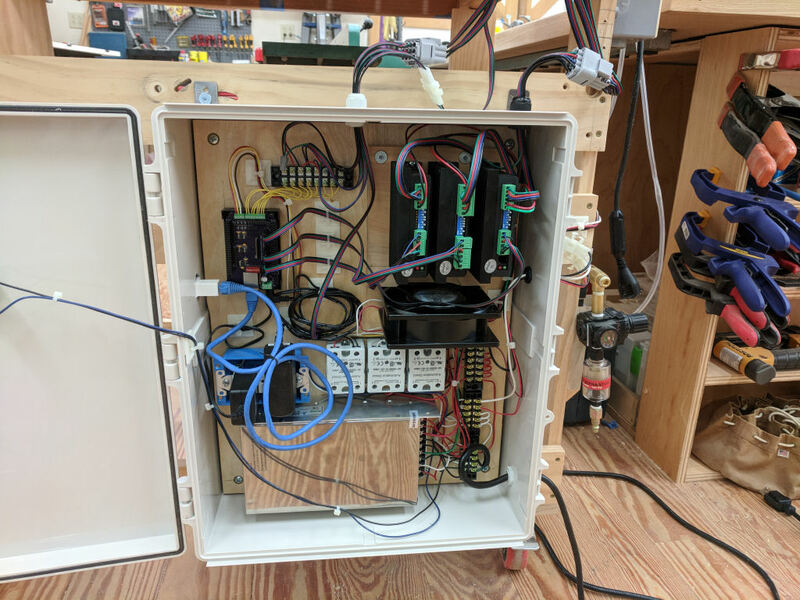 Here is the new system with the new electronics and enclosure with the wiring cleaned up and routed through cable carrying drag chains. System upgraded with new electronics and cleaned up wire routing. 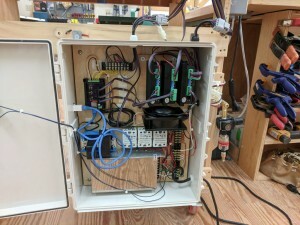 Here is a closeup of the new electronics in the enclosure. The drivers are much more powerful and the power supply for the motors was doubled in voltage (48V) to increase the stepping speed. Closeup of the CNC Router upgraded electronics. Here’s the new unit stowed. It tucks into its spot a lot closer now since the platform closes to full vertical now and I got rid of the attached display and keyboard. The new system uses Virtual Networking Console (VNC) so I can run the system from my laptop without any wired connection. 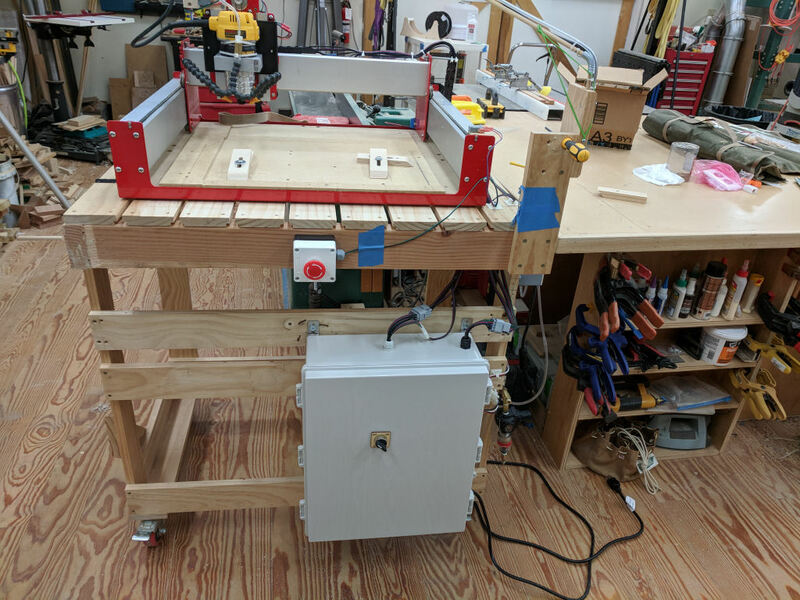 CNC Router stowed away. Fits much better than the previous two versions! Finally, for the first test, I decided to try the Pottery Stamp I’ve made with my original router. I checked in with Matt and asked if he wanted any changes before I made another one. As it turned out, he wanted a smaller version, which made this new one much more challenging! Happily, the new router was up to the task and produced a very high quality cutting with walls as thin as 18mil and wall height of 187.5mil (10:1 aspect ratio)! 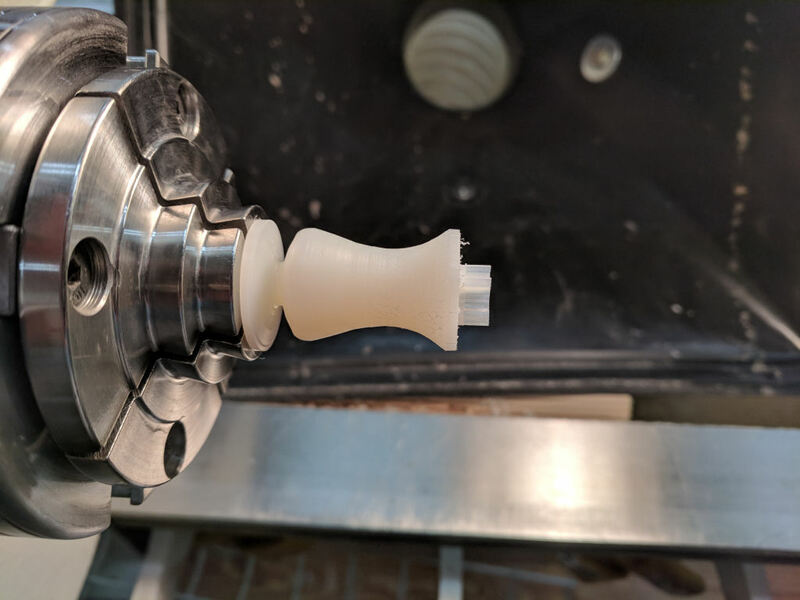 Side view of the first test of the CNC Router, turned on my wood lathe. This entry was posted in CNC Router, CNC Routing, Electronic Projects, Tools, Woodturning by TWStud.Bookmark the permalink.